Infant equipment are devices that hold your baby during playtime, activities, and during transportation. How much time should my baby spend in infant equipment? You should limit the amount of time your baby spends in car seats, jumpers, baby swings and other types of equipment. There are some situations that make using infant equipment unavoidable, such as while riding in the car. Try to limit baby’s time in equipment to when it’s necessary to keep them safe. What does the term “container baby” mean? The term “container baby” describes an infant that is perceived to spend too much time in equipment. Often when in a “container,” the baby is immobilized and in a position that places excess pressure on their head. What problems are associated with overusing infant equipment? The overuse of infant equipment can impact baby’s head shape by causing a flat spot, positional plagiocephaly, to form on their head due to having limited mobility. Positional torticollis, tightening of the muscles on one side of the neck, may also develop and can have an effect on baby’s posture and ability to turn head from side to side. Too much time spent in equipment can also increase the risk of delays in crawling, walking, sitting and even speaking. What can I do to reduce my baby’s time in infant equipment? Make sure you are positioning your baby to get plenty of Tummy Time each day. Begin Tummy Time as soon as you come home from the hospital by starting for only a couple minutes a day, and building up to an hour a day by three months old. Caregivers can also carry baby often and in different positions instead of using infant equipment. When babies are carried, they are provided with vestibular stimulation. This means the carrying motions stimulate their sense of balance and movement. Up and down, back and forth, and side to side movements help your baby to keep their head and body in a neutral position. If you’re considering purchasing infant equipment as a gift for a new baby or new mom, there are plenty of other items that will enhance the baby’s development. Try visually stimulating toys, large board books, unbreakable mirrors, textured toys, and stacking toys. See our growth and development chart for more information on your baby’s milestones, and never hesitate to bring up concerns with your doctor about your baby’s development. 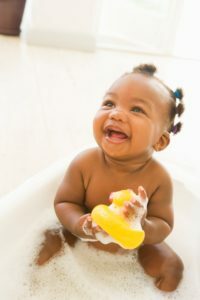 Try these activities to make bath time fun and help your little one’s sensory development. These tips will help make diaper changes fun and educational for your baby.